Ratings are averaged based on 474 reviews. Great location and facilities. A little expensive for food and drinks. Overall a beautiful place!! The entertainment was excellent. Staff were fabulous could not do enough. Kids club excellent. The craftsman was surpurb _ cultural aspect was so enriching. The outriggers Fiji was absolutely amazing. The people were all so friendly and kind. The place catered for everyone young and old. There was always something to do or you could just relax by the pool and enjoy a cocktail or two. The restaurants were fantastic and catered well for young fussy eaters. Bebe spa is a must, absolutely spectacular. Would definitely recommend to everyone who is considering going to Fiji ???? Went as a guest for a wedding. Great weeks stay for all. Fantastic resort as a wedding destination. Very relaxing with many choices of accommodation. Family friendly, and the staff were very attentive. Great for children. The nannies are amazing. Great views from all over the resort. We stayed in level 1, close to the water. The bures looked private and relaxing. The wedding was well run, as was the reception. The massage and spa building was on the top of the hill, idyllic. Lots of choice for food and drink. Also places to eat just outside the resort. Short bus ride to local town of Sigatoka should not be missed. A little pricey, but that's Fiji. The people and weather make up for it. Our family (10 adults and 5 children under 7) enjoyed a wonderful holiday. They all want to return next year!! The early morning bus trip from the resort to Nadi airport was the only negative. The service provided by Zac, our Talai butler, was amazing. The service and location was brilliant. We went for a wedding and the services for families was excellent, the adults only pool was a great escape from this. We love the Outrigger so much! We’ve just returned from our 3rd stay, and the reason we keep going back is the people. They are the friendliest, nicest people we’ve have had the pleasure of meeting. And we have travelled quite a lot. Our kids absolutely adore Fiji too, and LOVE the kids club. It was hard to pull them away to spend time with us! But crab hunting and races, frog hunting and races, weaving, coconut husking, watermelon cracking and pool activities are hard to compare to. Breakfast is wonderful with options aplenty, however lunch and dinners are limited to the resort and one nearby restaurant. The options are the themed buffet @ $69pp, Baravi with an Asian focus, IVI, high end and adults only, and the Sundowner, pizzas and mainly assorted meat dishes. I feel they could open up the menu with fresher salad options, or sushi for example, as well as offering ‘snacky’ type meals for morning and afternoon teas. This is a service not currently available, and is a potential $$ earner for the resort. It’s a 90 minute drive from the airport, but, we feel it’s worth it. We stayed in a Bure this time and absolutely loved it. The peaked roof adds so much ‘space’ to the room, and the Fijian stencils on the ceiling add such a nice warmth. The Talai butlers (certain rooms only) bring afternoon drinks and snacks, as well as a nightly turndown service of the beds, along with a nightcap and little treats - just amazing! There’s an adults only pool, as well as the main pool, and there’s always different activities happening throughout the resort. The Bebe spa is amazing! There are cheaper deals out there, but to be honest, we’re too afraid to go anywhere else in case it’s not as good, and then we’ll be wishing we’d just spent the extra money! This was our first time to Fiji and we loved it! The resort and the nanny facility meant we could enjoy the holiday both as a family and as a couple. The dining options at the resort are a little pricey so would recommend that people to explore the surrounding area as some great options at slightly more reasonable prices. As a family we loved it and can’t wait to do it again! Great pool areas and seating. Very comfortable by the pool. I utilized our included massage at the Bebe Spa which I would definitely recommend. It had a very relaxing atmosphere and the massage staff were very friendly and professional. The kids eat free deal was great. My husband was a little disappointed with some meals, but overall we had a great stay and we will be back again! I unfortunately fell sick for 3 of the 6 days we were there, however, the hotel was great at looking after me and made sure I was comfortable even though I was ill. They were amazing with my son, couldn’t fault them! I stayed at the Outrigger for 6 nights with my family (2 adults, 2 teens and 2 young children) recently and I couldn't be happier with our choice of resort. From the moment that we arrived the staff were friendly and looking to please us. Our room was always clean and comfy. The dining options at the resort were great and our kids particularly enjoyed the buffet breakfast. The pool is great with a mix of shallow and deep areas so that everyone is pleased. We utilised the kids club and the nanny services that were included in our package and the children really enjoyed it and the staff were amazing. We will be back I suspect. Wow, firstly the reception you get is really lovely when arriving. No spoiler alerts I will leave it for you to experience. Friendly, genuine helpful staff like the majority of Fiji. A large resort but less touristy than Denarau and more a local feel, which we loved. We loved the restaurant variety, adults only pool & restaurant option, Butler service, Bure option and spa. The staff made our holiday perfect and went the extra mile for my 3 year old son. Would definitely recommend this resort. The spa at the resort was located at the top of the hill and had the most amazing view. The massage was the best I have ever had. Staff were welcoming and friendly. The resort is neat and tidy with multiple options for food and areas to dine. We stayed 2 weeks for a holiday and a family wedding. The service was amazing and I highly recommend the outrigger resort. We really enjoyed the Outrigger and will be back. Great pool and service with outstanding food! The rooms are a bit tired but as you spend minimal time there it wasn't a big deal! Staff are very genuine and helpful, always eager to go above and beyond! The Fijians are lovely, welcoming people and looked after us extremely well. The resort has an adults only area that we used all week and it enabled us to get the most done (we went for a planning retreat). The snorkelling straight off the beach was amazing. Loved it, will go again. Beware though, food and alcohol are not cheap at all. The food was great, 5 for taste, but expensive. Great, relaxing holiday. Loved our Mei Mei, it was our first time leaving our son and Vani put our minds at ease and took great care of him. His face lot up every time he saw her. Staff so friendly and nothing was too much trouble. Food was delicious and perfect for kids, too. Buffet was a huge draw card for all of us. Poolside service and food were also great. Activities (Wildlife Park, water sports, kids club, art and craft centre) were so enjoyable and catered to all ages. Fijians are the loveliest people-so welcoming and friendly. I’d go again in a flash. Thanks Outrigger! Very happy with our stay. Our holiday was purely for family relaxation time, and that’s exactly what we did. Kids club were sensational, our daughter didn’t want to leave. Pool options were perfect for all ages. The spa was fabulous! One of the best spas I have attended. The therapists on both occasions were amazing & treatments were divine. Couldn’t not fault the hotel service and friendliness of the staff. Very happy with our stay & would love to go back. Stayed at outrigger with family and friends (6 kids) and the resort was excellent. The food, kids club, pools, amenities were top notch. The staff were so lovely and friendly even to our rowdy boys! We had a blast and would love to come back again! This was our second stay at the Outrigger in Fiji and once again it didn't disappoint. The staff are amazing and friendly, and so many remembered us from 12 months ago. The food options are great and there are so many activities for the whole family, the majority which are free. We will be back again for another relaxing Fiji holiday! Perfect for families and kids. Had a ball, will go back. Club and the Mei Mei nannies were great, so too was the daily butler service. Had a great stay at the Outrigger - staff go out of their way to make the children happy and give parents a relaxing experience. Overall, a great holiday with family, wonderful experience, friendly staff. Food was pricey but enjoyable. The staff were amazing and my kids (3 and 2 year old) had an amazing time. The food options for kids were great too with some healthier options so that they weren't just eating nuggets and chips the whole time! Cannot recommend enough if you have a young family. Wonderful staff and relaxing atmosphere. Our first visit to Fiji and made us feel quiet humbled by how hospitable and friendly the staff and Fijian people are in general. The resort was a wonderful oasis and we enjoyed our time away. Excellent hotel, staff are amazing and every commodity was of an amazing standard. Our second time there, will definitely return. We enjoyed our time at the Outrigger thoroughly, room was lovely, great view. Clean. Staff are soo friendly, food options were great. Excellent grounds, activities on offer were good and fun. We were so sad to leave! Overall excellent resort. Would like to have seen more pool activities in the afternoon for families. Great facilities and very family friendly. We got a great deal so was good value for money. Bebe spa was a-mazing and the view was spectacular. We loved our holiday the resort is well set up and people are so friendly. The pool was huge, service great and the kids club was excellent our kids loved it in there. The rooms we had were a little dated but it didn't matter because we were never in there. We had a great time as a family, boys loved all the activities that were on offer and were on the go the whole time. A very relaxing place to take kids, parents and grandparents. Good facilities, plenty to do at the resort with a warm and attentive staff to help the day along. The children enjoyed the pool, beach at high tide and the kids club. Some opportunities for activities outside the resort, but not many. However, the facilities inside the resort offered plenty of variety. Our bures worked well in terms of space and comfort and the butler service was a very nice touch. Beautiful surroundings and amazing service. Dining, Talai and general staff was amazing. Just sit back and relax, have a cocktails or a few and enjoy being taken care of. May I recommend Bebe Spa where the ladies are excellent and the views to die for. We loved our first time to Fiji and the Outrigger Resort. The nanny service and kids club is a must. Worked out a great holiday for both us and the kids. Thank you to the wonderful staff at The Outrigger!!! This is a fantastic resort and we thoroughly enjoyed our stay! We loved the Outrigger so much we'll be returning next year! All the staff are so amazing, food and drinks are good and facilities are top notch. Thank you Travel online we enjoyed a family holiday rest and recovery. The kids really enjoyed the resort and pools. The 'kids eat free' was great and a there was a good selection of foods all pretty healthy for the kids. The main food at the restaurants was good but expensive however, we did enjoy the IVI fine dining one night. The Mei Mei was a great service which Outrigger provided and we used with our 8 month old - she was so lovely with him. All in all a great place to get some sun and rest. Kids loved the pool and kids club. Good choice for meals. Would highly recommend Outrigger to families. We stayed in an Ocean Breeze Bure. A wonderful relaxing holiday. The staff are brilliant. Beautiful setting, ammenities and buildings. Heaps for kids to do (kids club). Coral reef (snorkelling, kayaking, etc). Great pool. Climate was great (late July). Even when at capacity - was still comfortable. We had an excellent time . We were made to feel welcome as soon as we arrived . Our room location was excellent ! Right on the beach and close to the activities centre and pool . My kids had a ball and the Fiji guys working in the activities centre were brilliant !! They knew most kids name by heart and entertained the kids daily with sporting activities , egg throwing . Loads of stuff !! Can’t believe how good it was . Highly recommended and will try to get back nxt year ! Happy people everywhere who went out of their way to help and assist. The accommodation and surrounds were beautiful and breathtaking as well. My son’s wedding was an experience of great atmosphere with the fire dancers, music and tasty food. Especially loved our farewell song. I wish we'd stayed longer. This resort was definitely a great place to spend a week with friends and family. The resort is lovely, a real natural setting amongst palm trees and meandering walkways around the grounds. The buggys are made available at all times to whiz you around the resort as needed. The staff were very friendly and accomodating even though a bit slow at times. The food was great, the entertainment and the kids club and mei mei nanny service was invaluable to me with 2 little ones. The ladies at the service and the kids club made me feel completely at ease and safe to leave my kids in their care. Finally the views from the spa are amazing, as is the service and staff. The treatment was lovely. Family resort with lots of activities for children. Very friendly staff. Whilst the rooms are tired and in need of renovating, the Outrigger was a fabulous 4 star resort. A lovely village-like environment, nicely laid out. Many resorts offer 'kids eat free from the kids menu' but provide such limited options, often with dessert being extra, that you end up having to spending more on the kids food in the end. However, not at the Outrigger. The kids menu had loads to choose from, included a drink as well as a dessert - no need to have to spend any extra on the kids which was great. Bebe Spa was truly 5 star and well worth the spend on a treatment. The most relaxing & enjoyable holiday ever! This was the perfect family holiday. Great to stay in Bure’s & get the extra touches of butler delivering drinks & canapés every evening, meal package gave us flexibility to choose where to eat, massages were bliss, activities & entertainment fantastic and staff were superb. The Fijians adore children so extra special for young ones. Service from all staff were absolutely amazing! Our children thoroughly enjoyed Kids Club. Being involved with the evening Torch Lighting was a memorable experience for them! The Community Tour was a memorable experience for us all & I would highly recommend everyone to do! Overall very happy with our stay & will definitely stay again! Huge family resort heavily geared for families with young children. The Outrigger is well set up with everything within 5 minutes walk and with the kids club and the pool area at the centre. With five restaurants to choose from, great service and friendly staff it made for a perfect family holiday. The kids club activies and program was the standout including very practical 3 sessions per day including a night session from 5.30 to 9.00 allowing us parents to have dinner dates. Would highly recommend it. FYI our kids are aged 7 and 5. This was our first trip overseas with a toddler and it was great! The staff were all very friendly! The buffet breakfast is repetitive though. We were upgraded to one of the Bures rooms for our first night which was a nice surprise. Very happy with everything. Our little family had a great time at the Outrigger Fiji. Nothing but good words about the staff and premises. Great family trip where the kids were entertained by outdoor activities and learning the local culture. Friendly and happy service and having nightly drinks and canapés delivered by the Talai butler was a luxurious treat each afternoon. We will be back! I loved the Outrigger Fiji Beach Resort. Staff were friendly and provided great service. Room was great and well maintained. The resort offers wonderful facilities. Highly recommend. Loved the resort. Rooms,restaurants,shopping and especially the staff were awesome. Thank you. Had a great stay at the outrigger. Great for families. Lots to do and the community school project is a fantastic idea. Our first trip to Fiji. We chose the outrigger as the kids club and mei mei service suited our family. The service was great, our children did not want to leave their mei mei who was amazing and the food was varied and we always enjoyed it. As with most resorts the drink and food prices were quite high but the service was fantastic. There was lots to keep you busy throughout the day with the pool and other activities like snorkeling, reef walks etc on offer. The fire walking show was great and the school tour was worth the price and the trip. Highly recommended family resort. Really fantastic holiday with our family here at the Outrigger. they made us feel really welcome from the very start right throughout our stay. Especially good was the way the chefs handled any allergy questions. Our son has severe Egg and Nut allergies , but as soon as they heard about the allergies ,they quickly indicated what was safe and what was not , but also offered to recook items without egg , where possible. This was a huge relief for us and one of the reasons we chose this resort , was the feedback from other families on this allergy-friendly approach. It didn't take much from their part , but it meant a huge deal to us..
Good place for couples and families. Great for weddings! We have just spent a week at Outrigger and i cannot rate it highly enough - from the room, food, staff, and nanny/kids club which allowed us some much needed time out/alone. I would recommend a bure if you can do that bit more, the hotel rooms are fine, but they are a bit of a walk to the pool and if your on top floor. We generally stayed at the resort and the kids were extremely happy. The staff were lovely, the pool was amazing and there were a good variety of eating options. we were very happy with our experience at the outrigger. This is the second time there and we were not disappointed. The service is great, very friendly staff and the food was very impressive, lots of variety and fresh, clean eating food. I really was impressed with the food. Also if you want 5 star restaurant food, the IVI had the best food i have ever tasted and i have been to quite a few 5 star dinning restaurants. Definitely recommend this to other families and couples. The resort was amazing and the staff beyond friendly . All the staff made you feel so welcome and like royalty . Drinks were a little overpriced . Outrigger is number one on my list. Everyone was very friendly and always helping if needed. Will go back anytime. The food was great. The resort offered everything we needed and wanted. Great facilities, a variety of activities and the staff were absolutely amazing. We did not want to leave! The service was great and staff friendly. the resort looked amazing. We went for a friends wedding the wedding planning couldn’t be faulted. The resort also put on a Anzac Day memorial which was both beautiful and moving. The service was absolutely wonderful, the Bure' we had was very well positioned. the only thing was the lunch and dinner menu's, could have a better selection. The prices are high considering the food. Great place to stay for everyone. We stayed with extended family and was one of the most relaxing holidays I've ever had. Staff were amazing and friendly, the pool was the best place to be. This was our first getaway and trip overseas with our young family. We went out of peak times and managed to get a great deal which was definitely great value for money. It is an amazing part of the world with great facilities and very friendly staff. There are lots of activities and events going on, many of which are at no extra cost. The staff are ridiculously friendly and very accommodating of our young family. The prices are similar to Australian prices, rather than Fijian, but it is good value considering the type of resort it is. We were all sad to leave and we would definitely go back. We were a family of 6 adults, a 5year old and 9month old baby so it was good to be able to spend our time together at the resort. There was plenty of things for each of us to do without going off the resort. We took our 6 children over to outrigger Fiji resort and had the most amazing time. The room, the views, the beach, the lovely people, everything was perfect!!! We were actually in paradise and we can’t wait to go back again. A great place to stay for couples, families, everybody!!! Vinaka outrigger resort, you were awesome. Rooms were perfect, service and friendliness of staff was outstanding, all food venues we experienced were fantastic. It was just great. The stuff is very friendly the food all up very good. And you have everything you might need there. We absolutely loved our time at The Outrigger. All staff were extremely helpful and happy, everything was reasonably priced and the property is stunning. 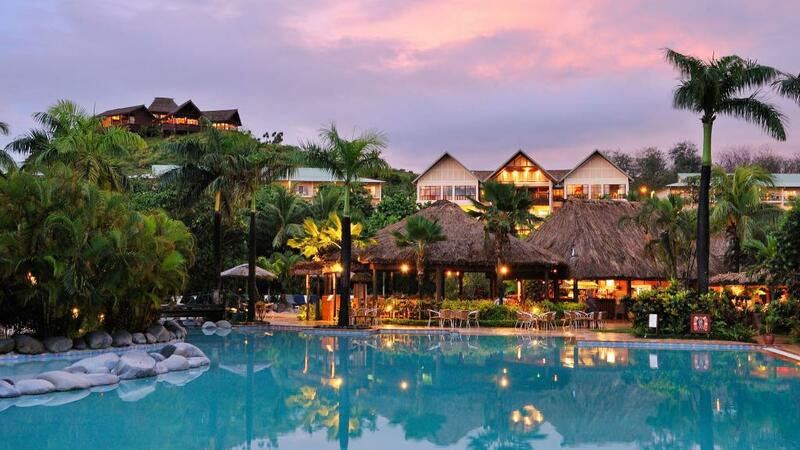 Perfect resort for families, couples or a singles trip away. We loved the outrigger. Our kids loved going to the kids club each day which meant it was like a second honeymoon for myself and my husband. Great facilities, superior rooms certainly good enough !! We had interconnecting superior rooms, these rooms were great! Big rooms and bathrooms, well furnished, very comfortable. Spa was good however some service improvements could be made. Went to Fiji for wedding had to be cancelled and rebooked for next day. Very stressful due to personal circumstances however dealing with events staff made it easy to rebook the next day without too much hassle. Thank you so much for their expertise in last minute arrangement in emergency situation as well as medical staff at resort. Tave our nanny was absolutely fantastic she was so lovely and helpful. What a lovely lady. Our kids really liked her. Thank you. Nanny & kids club well worth it. Well looked after resort. Chapel is beautiful. View up there is out of this world. Great holiday which ticked all of the boxes. Perfect holiday which ticked all of the boxes. Overall we were happy with the Outrigger and enjoyed our holiday with the family. The staff were very friendly and the facilities were well maintained. Lovely resort with great, friendly staff. Great snorkelling off the beach but needed to be aware this was often only available for 2 hrs/ day. Food options for kids and adults were good initially but a bit tiresome after about 4 days. Did a couple of great day trips (Whales tale island trip + Singatoka river safari) which meant I didn't have cabin fever feeling cooped up in the resort. Kids absolutely loved it and even managed a couple of kids club sessions when it is usually not their thing + also loved the resort activities. Caters for most needs and desires. Helpful friendly staff with clean facilities. everything available at resort prices, short trips or walks for alternate options. Music with a happy pleasent vibe, activities and quite spots. Fun and laughter all day long! Kids loved the pool, kids club and their nanny. Adults loved the adults only pool and swim up bar. All the staff were so friendly and helpful and the gorgeous lush garden setting and ocean sunsets were perfect. Treat yourself to the fine dining restaurant and amazing views from the spa! We stayed in August 2017 with our 2 and 7 year old boys. The kids club and nanny service is brilliant. The whole resort and staff are all fantastic with kids. The pool is also plenty big enough and has great areas for the little ones to walk around. Lots of food options, and given your in a large resort food was good and prices are not too over the top. The resort is a good 1.5h drive from Nadi so any activities around that area are a long day trip however there is plenty to do at and within half an hour of the resort. Just back from six nights at Outrigger. The rooms were very comfortable and clean. The staff were all lovely and helpful. The pool is great, especially for little kids. We enjoyed our stay here. Meals were good. Great family resort. The staff were wonderful. We were so pleased how the children were treated. Your system of children eat free is great. The staff's ability to split the dinner bill for different rooms/different couples was great. Our butler was magic and genuinely friendly especially with our grandkids. Great family friendly hotel that caters for a variety of different people but mostly families. Kids club is great and has a range of activities for kids aged 3-12 and if younger there is the Meimei serve which we used last time we were there. Restaurants offer a range of options and we stayed in a Bure which is fantastic with your very own Talai (butler)! Fantastic holiday and great venue. Absolutely awesome holiday. Memories to last a lifetime. Our stay in Fiji exceeded all expectations. The outrigger staff were absolutely outstanding. Extremely friendly and genuine, especially our butler Jonetani. Can't wait to go back. Fiji is such a great location for holidays for couples or families and there is something for everyone. The only complaint I have is that it is very expensive when purchasing Food and Alcohol. Great place to stay. Had grandkids with us, so much for them to do. We have visited this resort a number of times. My daughter was married here as well. The Bebe spa is unique in architecture and location and is definitely worth visiting for a treatment. The Ivi restaurant is ideal for a special dinner. Rooms and grounds have not changed a great deal and are in good condition. The best rooms to stay in are the bures. I think the buffet breakfast is due for an upgrade - it has not changed over a number of years. We ate at the Sundowner Restaurant most evenings which we enjoyed and the service was great. The resort was great, staff friendly. Food amazing. Kids club was ok but found nanny service better option for this time. Will definately stay again perfect for families and groups. The Outrigger Resort is the most beautiful place to go for a relaxing holiday. My daughter got married there and it was so beautiful we could not falt it, the people are so welcoming it was a pleasure to stay there. A token machine in the laundry room would be beneficial so you dont have to go to reception every time you want to wash.
Staff were amzing, especially activities workers- the kids loved them! Went for a wedding, loved every minute we were there such beautiful and friendly people live in Fiji. Hope to visit again perfect holiday. We enjoyed our stay so much that we will be returning next year. Salote and her staff are helpful and caring. We were there for a wedding. You could not wish for a more perfect setting. You can join in the daily activites or spend your time relaxing. A great choice of places to dine. Had a good stay at the Outrigger - was there for a wedding and the location and set up was great. Good food and happy hours! My wife and I enjoyed every moment of our holiday at the Outrigger. The hotel was excellent, the food was amazing and the staff were fantastic, they were very friendly and attended to all our needs. A wonderful family resort, everyone loved it. We found our trip to the outrigger on the coral coast fiji a great family holiday everything was catered for. the meimei service was fantastic and gave my wife and I the break we needed. My Husband and I had a wonderful time at the Outrigger it was the best holiday ,very relaxing and the Staff at the Outrigger was so Friendly it was 10 out of 10 !!!! We stayed at the Outrigger for 10 days and we had a great time. Plenty of choices on how to spend your time on the resort, plenty of food and drinks choices. The rooms were large and well maintained, the food was great, the pools were amazing and the staff were fantastic. Overall we had a really good time. We had a fantastic time. The resort is great for families and has activities to keep the adults entertained as well. We were travelling with 3 kids under 4 years of age. Beautiful resort really geared for families. Lots of activities to do on site. Local beach and coral reef was surprisingly really good for snorkeling. Giant clams, lion fish and plenty of reef fish. The staff really made our trip, so happy and nothing was a stress or too hard. The staff had plenty of cool local tips and lots of interesting stories to tell. We loved staying at the outrigger resort Fiji , close to everything , in a beautiful location ,excellent staff with exceptional service.We will be back. Perfect venue for our family. The ability to put the kids into kids club is we could enjoy a few dinners and time in the adult only pool was wonderful too. Perfect resort that caters for everyone. I cannot recommend the Outrigger Fiji Resort more highly. It caters beautifully for both kids and adults and there are soooo many activities on offer, most of which are free. There are multiple restaurants at the resort which are all yummy, and the buffet brekky is divine. We had a "kids eat free" package, so we found if we filled up at brekky, we could easily save a few dollars and skip lunch (the kids had their free lunch), then we all had dinner. Happy hour at the poolside bar was also great (gotta love half price drinks). I loved being able to try scuba diving for the first time by participating in the free pool lesson (loved it so then signed up for an ocean dive which was all organised through the resort). The resort can also organise numerous day trips for you with ease. We loved having the opportunity to mix with the locals on the local village tour. And finally, the staff were simply wonderful. Nothing was too much trouble for them. I have to say, the Fijian people are pretty much the friendliest people on earth. We really enjoyed our stay at The Outrigger. We knew little about the resort and found our stay to exceed our expectations - we loved the friendly and welcoming staff and found that the resort had a good balance of restaurants and activities for our family (boys aged 9 and 12). We came home feeling very relaxed and energised, Vinaka! We absolutely loved our stay at the Outrigger resort in Fiji with our two primary school aged children. The pool was divine and the children also loved the scuba diving, stand up paddle boarding and kayaking. There was a good selection of restaurants at the resort as well as a few local restaurants nearby for something different. What really made our stay however were the staff. They were so friendly, professional and welcoming, The man who delivered our complimentary champagne and canapes to our room each evening was lovely and recognised us each day when he saw us out and about in the resort. He made us feel special. I would highly recommend Outrigger. As a huge plus they also employ about 600 locals from nearby villages which is fabulous. Fantastic resort. Great for families. Will definitely stay here again. We loved our time at Outrigger... we enjoyed exceptional service, there was plenty for the kids to do, as well as adults-only facilities (spa, hilltop tapas bar, pool), which made it the perfect spot for the whole family. We had a good time at the Outrigger. My favourite things were the swimming pool and the live music throughout the resort. This was our first family holiday overseas, and I am very impressed, everybody from the shuttle bus driver to all the staff at Outrigger were amazing. We were even greeted with a big open arm BULA from the smiling man at the gate. I have 6 children and highly recommend kids club, the kids keep wanting to go back for more! What's even better is whilst the kids are in kids club you get to enjoy the luxury of the adults only pool and bar, it is bliss. The resort caters for everybody, on one half you have fun for the kids in a massive pool where they have daily activities, poolside restaurant and drinks, and on the other side the calmness of an adults only pool with a bar you can swim to. Wonderful resort! Such friendly and attentive staff. Beautiful resort grounds. Plenty of delicious food options. Lots of activities and a fun Kids Club too. We had a wonderful week at athe Outrigger and can't wait to visit again! the resort and people were fantastic. the grounds are amazing. so lush and we'll kept. the facilities are all clean and we'll maintained. the pool is huge and fun for all ages. Although we went in the off-season and the weather was wet and humid we had an excellent time at the Outrigger with our two kids (3 year old and 20 months). The highlights included the Meimei (nanny), kids club, the pool at the Outrigger, the Talai service for the Bure and all the staff were helpful and friendly. The resort is absolutely beautiful and facilities top notch. The staff are so very friendly and great with kids. On the negative side, the food was expensive and the beach a bit of a let-down. But if you make use of the pool and the other facilities it's quite easy to overlook. Best holiday, great location, great hospitality!! The Outrigger was a fantastic place to stay. Everyone was very friendly and accommodating. Kids loved the Kids Club and all the facilities it had to offer. Will definately be going back. Travelled with Grandma, Husband and 3 children/young adults 9, 14 and 18. Stayed10 nights in a one bedroom suite with interconnecting room. Plenty of space for us all to spread out. We thoroughly enjoyed our afternoon champagne and canapé delivered to our room and then evening liquer and sweet treat. This was a beautiful touch to a most relaxing and enjoyable holiday. I would highly recommend the cooking class on Thursday lunchtime - a fantastic experience as well as the visit to the local village - truly memorable. You would not find a more enjoyable place to enjoy an afternoon cocktail and tapas than the bar at the top of the hill and the ride up and down in the buggy was a great experience too. What makes this resort however are the staff who couldn't be friendlier or happier - I'm sure this rubs off on all who stay as the general ambience of the resort is one relaxed and happy vibe. All the fun of Christmas was fabulous, especially Christmas carols on Christmas eve and carolling again on Christmas night. Santa arriving in a dune buggy was spectacular and so much fun for all. We especially loved the Sundowner Bar for breakfast, lunch and dinner! All the staff were fabulous, the music was beautiful but we must especially mention 'Macca" - the waitress who radiates joy! What a wonderful stay. Vinaka! No words could explain how much we enjoyed staying at the Outrigger Fiji Beach Resort. It's amazing!!! The accommodation and overall Resort was stunning and the staff were simple beautiful. They went far and beyond what they needed to, to make you feel welcome and a part of the family. Vinaka Outrigger, you will be sadly missed but we're already planning our return. I have already suggested to my sister that she and her fiancé honeymoon at Outrigger next year and I will definitely be back next year! Outrigger was amazing; the views are beyond beautiful and it's the ultimate getaway destination. A huge Bula from me. We had a fabulous time and loved the whole experience. Staff at the Outrigger were amazing and went above and beyond. Ana, Luke in Gym, Magic Mike and Tumeli were just beautiful and gave us the best customer service. The facilities were great just disappointed we couldn't use the beach a little more because of low tides, which is out of your control. Bebe spa service and package was amazing and we will definitely be back to the Outrigger in the future. A huge Vinaka from me and my family. hotel - excellent! beautiful views! staff - friendly and helpful always greated with "bula" everywhere i went. food - i enjoyed breakfast the most!! beverages - pricey so make the most of "happy hour"
hospitality - alot of fun daily activities for kids and adults try "snorkel fishing"
giftshop - do NOT buy souveniers from town!!!! the gift shop and mini markets within the resort are the best deals you can get!!!!! overall -stayed 6nights and loved everyday here!! must try the "bebe spa experience"
We have just returned from 10 nights in a garden bure with Butler service. The bure was clean and located well in regards to easy access to adults pool and main pool and dining etc. The main pool area is lovely, well maintained and warm, get there early if you want a shady umbrella. We thoroughly enjoyed the spa service and dinner at the Ivy for special occasions. The guided reef walk is also recommended. The gardens are especially beautiful at this resort, you really feel like you are in paradise. Cocktails on sunset at the Sundowner Bar are a must. We highly recommend this resort for a relaxing, up market holiday. Great as usual but eating in house is expensive. Not a fan of "no cash" system. Great. The staff are wonderful. However drinks very expensive and soon mounts up. Staff great and friendly. Pools lovely. Night times fun with live singers. Good for kids and parents with free kids club and free dinners for kids so parents can eat in peace.. breakfasts worth the extra. Drinks too expensive and soon mounts up so keep an eye on your spending. Can't wait to get back there! We stayed at the Outrigger with four other families. Eight children in total, ranging from nine years to twelve years old. We had the most fabulous time! The staff are absolutely amazing. The resort is clean, rooms are well serviced, and there is nothing we could have wanted for. We ate in the Sundowner Grill each night and were attended by King George and Dee. They were fantastic. Martha looked after the kids and they loved her too. Great resort to stay, lots of activities too keep us busy, gorgeous pool. We were there for a friends wedding. The whole resort is lovely. The Beach is a little disappointing. Plenty of bars and different dining choices. If you just want to relax the adults pool has a swim up bar. Go to Bebes Spa and have a massage. Happy hour starts at 4 PM. The staff at the resort are the most beautiful and friendly people you could ever meet. Had a great time. Wonderful trip to Fiji and Outrigger was fantastic..Thanks to Michelle and Travelonline as everything went smoothly and could not have asked for more.. What a wonderful place and the Fijian people are truly beautiful.. My kids can't stop talking about the people and we will definitely be back. This was our 3rd stay at The Outrigger and we'll definitely keep coming back. It's an amazing resort, with lovely staff, delicious places to eat and great amenities. The staff can't do enough for you, they are so genuinely friendly. The food has always been yummy and both pool areas are wonderful. We love The Outrigger. This resort was fantastic. The people working their provide some of the best service we have ever experienced. We had a lovely 6 days, weather was almost perfect! Great selection of dining options. Spent majority of time by the adults pool - swim up bar was great! We had a great family holiday and can't wait to be back. We absolutely loved our stay at The Outrigger. We had a warm welcome into the hotel, the service was fantastic, and the resort was beautiful. Our Deluxe beach view room was nothing but amazing. Great room with an awesome view and large balcony. Id highly recommend this accommodation to anyone and everyone travelling. Not far from the local town for shopping, close to tours aswell. There is enough activities around the resort to cater for all, and the food was just delicious. We will be returning next year with our extended family. VINAKA from Australian travellers. Nice rooms. friendly staff. lots of resort activities. We went in school holidays so very busy. wouldnt reccommend for couples travelling without children. Relaxing place. Wonderful for families. Amazing kids club. Lovely place to go, I thought a little expensive for what it is. We loved our stay here. We had a family plantation bure - great space for all of us. The pool was lovely and large and kept the kids entertained for ages. The food was also great - buffet breakfasts, lunch by the pool and most dinners at the restaurant looking over the ocean. Extras included the fire walking show and I had a 3 hour spa treatment one day which was a real treat. Very relaxing. Would definately return. The hospitality was fantastic, staff were all very friendly and accommodating. Staff were very kind to decorate the children rooms for their birthday and made such an effort to spoil them. Hotel food was expensive, and it was a shame we could not access the kids meals via room service. However, overall, we highly recommend this resort. I would like to thank the TravelOnline team for all your efforts for assisting out big group for a wedding at Outrigger resort. I can't fault anything. The staff were attentive and amazing, the resort was perfect for our daughter's wedding, the weather was great which allowed us to get out and do some activites and the restaurant/s on site served good food! Thanks again and happy to recommend (especially for a wedding). We were impressed by the resort, the facilities and the services. The pool area is just amazing for little ones. The food was amazing and we couldn't be happier with our holiday. We loved our stay at Outrigger Resort! The staff were all friendly, kind, caring and so welcoming! We felt like part of their family. The kids had a wonderful time, lots of activities for them to do! We loved our stay at the Outrigger. The staff were so welcoming and friendly. Great for families with lots of planned activities each day. Buffet breakfast is a must. Only negative is the rooms could do with a bit of an upgrade. Absolutely loved our time at the Outrigger Fiji, we are a family with children 6 and 7 years old. Rooms are beautiful and very clean, the resort has everything if you don't want to leave. The coral lagoon is shallow and perfect for kids, you can literally walk a few steps into the water (kneee height) stick your head in and see coral and fish, go out a bit deeper and there is beutiful soft coral and numerous species of fish. The staff at the resort are so friendly and helpful, the food is excellent we ate at the resort every night, could not fault any of it. Drinks are pricey but what you would expect at a resort. Would recommend to anyone. I really enjoyed the Outtrigger And Fiji. So many activities for the kids and restaurants to choose from. A great deal trip and a great holiday! I am already recommending all my friends. I couldn't complain at all. Everything as hoped for and more. I would certainly go back again. Food excellent! Ivi restaurant is amazing, Sundowner brilliant! Kid's club a real hit. Staff are unbeleivably friendly! Great! We had a great week at the Outrigger. Facilities were good, a range of food options and plenty of activities for the kids (and the older types if interested). Overall a good time and we'd happily go back. The Outrigger is a very beautiful resort. They cater extremely well for children and the staff are all very friendly and helpful. The beach is quite corally but perfect for snorkelling and watching the sunset. I would definitely go here again. A really relaxing holiday. Kids loved kids club and learnt a lot about Fijian culture. Beautiful resort and amazing food. Very expensive food so be prepared to pay a lot. Just a few issues with some services-In spite of these issues, it was a really lovely holiday. A great resort if you don't want to do anything except relax. Being on the coral coast it usually involves more travel time for day trips. Has beautiful spa treatments that involves a golf buggy ride to the top of the hill, which has a view over the resort. The rooms and facilities here could do with a facelift but we forgot about that quite quickly as we enjoyed our stay a lot. I especially enjoyed the pool activities - 11am for pool aerobics was always a lot of fun. Dining is pretty good, with at least three options for families plus a kids buffet at lunch on the lawn. The Outrigger was a very clean nice place to stay. Restaurant options were nice and staff were friendly. Out riggers is a very nice place to stay with friendly staff and service, the overall experience of the FIJIAN culture was outstanding. The Outrigger is a superb resort and can compete with any in relation to quality. Pool facilities, planned activities and Kids Club were simply amazing and truly well organised. People are so incredibly friendly, that you simply get sucked into "Fiji time" which is not based upon any clock, but rather a much more relaxed way of living, which we appear to have forgotten. Regarding food, style and variety was ok, but rarely of the highest quality. For families this may be ok, but seemed not to be quite up to the standard of everything else. Rooms are OK, depending upon your size requirements. We had 2 double beds, which for the 2 kids and my wife and me, was just a little too small. A Queen size bed + 2 singles would have been much better. Location of the resort makes it difficult to get to other places easily, with limited tourist highlights within two hours drive from resort. Also the beach, whilst good for a some basic snorkeling and kayaking, is uncomfortable to walk on in bare feet, when compared with the sandy Australian beaches we have been spoint with. But overall, a great holiday, thankyou Outrigger staff "BULA" Fiji. Memorable stay. The staff at the outrigger are amazing with kids and the setting is beautiful.. A couple of great restaurants near by and at the resort but expect Australian resort prices or higher. Overall we had an amazing week and weren't ready to come home..Fiji we will be back! We stayed at the outrigger for 10 nights, with our family and a couple of friends. We can not speak highly enough of this resort. The staff were so friendly and helpful, the food was great and facilities were excellent. You could do as little or much as you like with the daily activities on offer. My 2 daughters (4 & 6) had the an amazing nanny and loved the outdoors movie nights! Will definitely be going back!! My family and I had a fantastic stay at Outrigger. The friendly staff, great food and the overall quality of the resort were perfect. I cannot recommend this place enough. Pools are awesome, the kids didn't want to come home! Outrigger Fiji Beach Resort is a beautiful place to stay whether it is for relaxing or joining in the many activities available. They have a weekly activity newsletter which allows you to plan your day and make sure that you don't miss out. The staff are always happy and friendly and make you feel part of the Outrigger family where nothing you need or ask is too much. This was our first holiday to the Outrigger Fiji Beach Resort, and what a holiday it was!! The staff were incredible, the resort was so beautiful, the food was amazing....it was such a lovely holiday that we are already planning our next one! Thank you to everyone at Outrigger Fiji Beach Resort for having us!! The deluxe ocean view rooms were a little dated but adequate. Great pool and friendly staff. Sundowner restaurant was excellent and there were great eating options not far from the resort. We were made to feel very welcome and the staff are friendly and accommodating. Room couple possibly be a little small for 4 people but we weren't in the room much. Lots to do, lots of fun and we all want to go back! Food and beverages very expensive. As a group of friends visiting for a birthday we couldn't fault the service or the location howevrer the last night we went to Ivi restaurant and whilst the food and service was great the wine prices were ridiculously high. We will be back... We had a wonderful time. excellent location to stay with children under 12. Good family atmosphere, brilliant staff and a lovely location to stay. The entire trip including transfers was easy to organize and worked with very little stress. beautiful resort, friendly staff, food is great, but it can be noisy if people/kids talking and crying outside your room. Overall the experience was quite good however the cost of meals and drinks on site was quite high particularly as we did not have a breakfast included package and the breakfast was not good value. We had the opportunity to contribute to a community project which was rewarding. Outrigger Fiji is one of the most amazing & unique resorts! The staff there are absolutely incredible, friendly & down to earth. We had such a wonderful holiday. The only downfall was the price of everything. We were lucky to get a great deal with our rooms & two free spa treatments per room but the food and beverage prices have increased. Overall Outrigger Fiji is our favourite holiday destination!! This was our first overseas trip with our two primary school aged children and they had a ball. The kids club is fantastic and as with all Fijians, the ladies running it were super friendly and welcoming. It provided some nice couple time for us knowing that our kids were being well looked after and doing fun activities. I thought it was great having a separate adults only part to the resort as there were quite a few families with pre school aged children so couples and singles were able to enjoy peace and quiet if they preferred. We spent lots of time in the huge pool. The food, although pricey which we had expected, was amazing. The kids ate for free and the variety was really good, the usual chips and things but also healthy options and separate kids' buffets alongside the adult ones. The room was fine, nice and cool with the air conditioning. The bed was a bit soft and the shower would go a bit hot and cold but it was fine. The housekeeping was great and we had the added bonus of having our own butler who provided complimentary drinks each night. We also returned each evening to find bottles of complimentary water which was a nice added touch. The Kula Eco park which is a five minute walk from the resort is a must see, the kids really enjoyed being able to hold a snake and iguana. Overall, a fantastic place to stay. We wish we could have stayed longer but we will definitely return. Bula! The staff are very friendly and exceptional at customer service. Hospitality is amazing. They do not miss an opportunity to smile at guests and greet them with "Bula". I enjoyed the Buttler service with complimentary alcohol and canapés , the turn down service, the vouchers for massages and the free meals for our daughter. I noticed even more how much better the outrigger is after staying at a resort in Denarau for just one night on our last day in Fiji. The Outrigger certainly lived up to our expectations for a family holiday. The pool area is great and there is a good selection of restaurants for eating with the Sundowner and Ivy being the best. The staff are friendly and break in to song regularly to sing Happy Birthday, or the Farewell song which is beautiful. Young kids loved the pool and getting their hair braided but There is not much to do for older teenagers and nightlife is limited so 5-6 days is about long enough. If you are looking for a family friendly holiday with young kids, you will be very pleased. Totally blown away by the beautiful people of Fiji, the resort and the services provided. We had the best family holiday ever and this was largely due to total relaxation at this wonderful resort. Will recommend the outrigger to all our family and friends, it is an experience that has brought us closer together. Beautiful resort catering for under 12s. Very expensive holiday. Lots of activities for kids under 12, they loved it. Nice room and good service. Would not return based on food and drink prices being extremely expensive. Also limited options for food. We couldn't of asked for a more family friendly and relaxing holiday with the kids. All the staff were so friendly especially with our daughter and we felt so at ease having the nannies look after her. Our daughter really loved them and her time at the kids club. The food we really nice and although everyone says it's expensive its about the same as what you would pay if you stayed at a resort in Australia although the alcohol was a bit pricey. The kids menu had a good varity to which i wasnt expecting . The room was spacey with two double beds and that was the basic room so very impressed. The pool was amazing and we practically lived in it everyday. Over all we can't fault it, we can't wait to go back. Our stay (with my husband, 13yo son & 10yo daughter) was everything we'd hoped for! Relaxing, friendly, enjoyable, with plenty to do or not do. Just the right mix! Our 2nd visit to the Outrigger Fiji Beach Resort was for our honeymoon. We had an amazing time with great activities like snorkelling, kayaking and swimming available within the resort. Meals were delicious especially the buffet breakfast. Our Talai, Semi, was a fantastic help. Our room was spacious and clean with air conditioning and a fan. Would definitely recommend this resort for families and couples for a complete holiday. Would like an alternative to the Iced Tea welcome drink on arrival such as juice or ice water. The Fijians are beautiful people and always greet us with a big smile and "Bula". We found Outrigger excellent, our room was good and the butler service fantastic, I would recommend it. The adults swimming pool terrific too. The only bad comment is that the wine is very expensive, even though we know it has to be imported, we still thought it was too much. The Outrigger Fiji Beach Resort is amazing! Friendly staff and fun activities for everyone to enjoy, including an extensive pool area. Fabulous location with beachfront access and stunning ocean views!! If you get a chance, be sure to visit the Bebe Spa and indulge in one of their premium spa treatments! Divine!! I would highly recommend the Outrigger Fiji to anyone considering Fiji as a potential holiday destination! Great atmosphere, very relaxing resort. Everything we wanted in a holiday. Loved every minute of our stay at The Outrigger. The staff were all so lovely and helpful, they really made the holiday stand out from others. Great value with the kids club and kids meals all free. We also love love loved the Mei Mei. Our nanny was just a beautiful lady. We will definitely be going back! we travelled with our 2 children. resort offers perfect balance of activities and down time. girls loved the kids club. dining was pricey but expected. pool area 10/10. staff are wonderful, and the resort wouldnt be the same without their friendliness and hospitality. would definitely return.